The Turk's head is widely used as a decorative button but is also useful for covering string end areas. 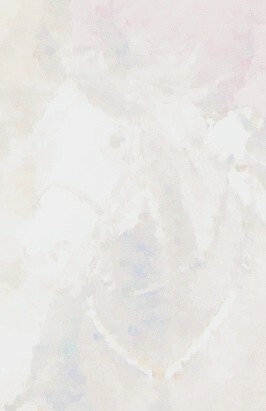 It adds balance and weight to items such as braided romal reins. Those chosen for this book are a group of smaller Turk's heads rather than longer ones, such as the long pineapple button. Also included are a couple of pretty and handy narrow Turk's heads. 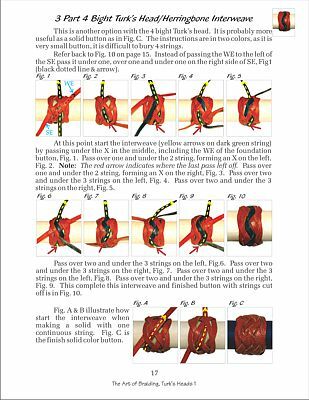 Understanding the pattern will make braiding most Turk's heads easier. 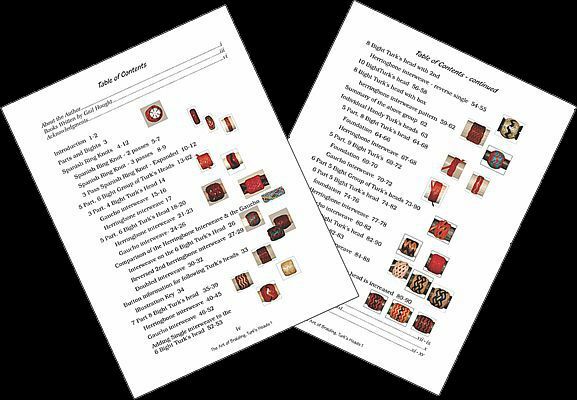 A majority of buttons follow the same rules with a few minor changes, however there is only a single correct pattern for each one. With experience, the patterns become easier to understand because of their similarities. 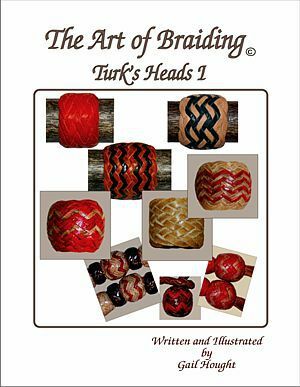 The useful and attractive 5 part, 9 bight Turk's head is a good example of the need to learn the pattern. See pages 69-70. The word button or knot appears in the text, but do not be confused, they still refer to a Turk's head. The terms lace and strings are interchangeable. 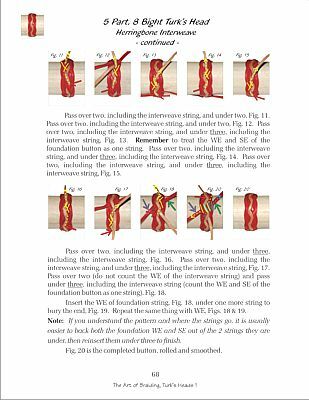 In the past, the word lace was something I thought of as coming from a spool therefore I always used the term string until I started writing these books. Describing the Turk's head by its parts and bights can be confusing so, whenever possible, their common nicknames are used, if known. Some nicknames I may have coined. Refer to page 3, for a detailed explanation of parts and bights. The majority of this book discusses two Turk's head series. The first series are those that increase by 2 bights, technically to an infinite number but not practically. The series most of us are familiar with is the one that has even numbered bights with the parts being 1 number higher, such as 7 parts, 6 bights. For brevity, I have always shortened the names to 6 bights or 8 bights, and so forth. 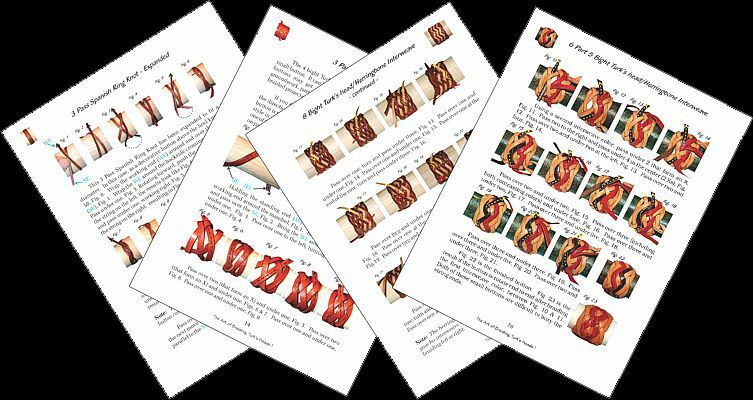 This series is what I consider the most important and valuable that any braider can learn, especially with a herringbone interweave. They can cover any round object of any size or shape. 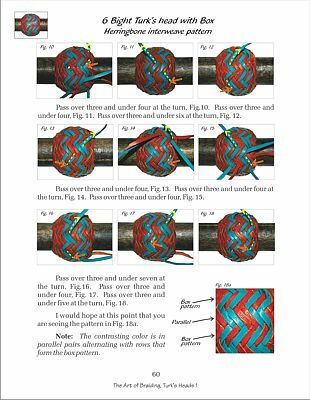 This is why they are braided on the bosal heel knot. As many rows of herringbone interweave as needed, can be added to fill the button. The gaucho interweave on these Turk's heads is nice and some very useful, but best only as a single interweave. The other Turk's head series that can be increased by 2 bights is similar, but has an uneven number of bights with the parts being 1 number higher, such as 6 parts, 5 bight or 8 parts, 7 bights and so forth. 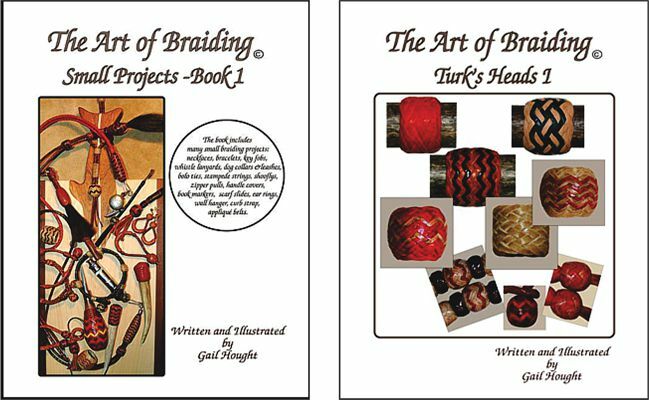 It is not a more difficult Turk's head to braid, just different. It can be braided with a gaucho and herringbone interweave. It gets interesting when braiding a herringbone interweave. The result is a variety of patterns, as the foundation button increases in bights. I hope you will enjoy learning it and its possibilities. "The Art of Braiding, Turk's Head I"
The Art of Braiding , The Bosal 1- Rev.